In 2016, some 500,000 offenses were registered in Austria, with 40 percent of them being committed by “foreigners,” a new security report presented by the Interior Ministry says. According to Kickl, the number of foreign offenders increased by 13 percent. The Austrian vice chancellor and head of the right-wing populist Freedom Party (FPO), Heinz-Christian Strache, also told journalists following the government meeting that asylum seekers accounted for almost 46 percent of foreign offenders. He described the figure as “significant” and called for a stricter refugee policy. “This shows that those who come to us to allegedly seek protection are also those from whom we then have to protect the Austrian people,” Strache said, as cited by the Kronen Zeitung daily. Kickl and Austrian Chancellor Sebastian Kurz, the head of the conservative People’s Party (OVP), have both called for a “tough” and “restrictive” asylum policy. Kickl particularly called for accelerated asylum proceedings and deportation of failed asylum seekers. Other measures proposed by the minister include allowing the authorities to access refugees’ smartphones as well as introducing mandatory age checks for asylum seekers. 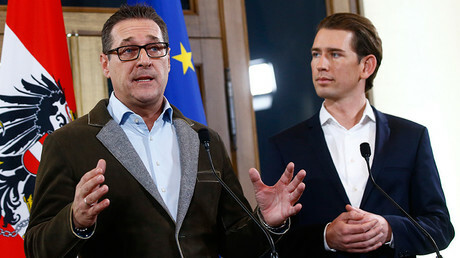 Following the government meeting on Wednesday, Kurz and Strache also said that they would stick to their election promises and enhance security in Austria. The new government was sworn in last month, swaying sharply to the right of the political spectrum with the inclusion of the FPO in the coalition. In October’s parliamentary election, the FPO, known for its hardline anti-immigrant stance, came in third with 26 percent of the vote. Strache’s party clinched a deal to form a coalition with the OVP led by Kurz, who also took a more hardline stance on immigration. Anti-immigrant sentiment appeared to grow in Austria after it was overwhelmed by a wave of asylum seekers fleeing war and persecution during the refugee crisis. Since 2015, the country has taken in some 150,000 asylum seekers, which accounts for over 1 percent of its population, one of the largest shares per capita alongside Sweden. Strache has previously offered controversial proposals concerning asylum policy. He recently suggested housing asylum seekers in barracks, adding that a curfew could be imposed to keep them there. Later, he clarified that the government so far had no such plans and that his idea was currently off the table.